So you are in the middle of a fascinating game, all pumped up and literally on the verge of a climax; a couple of more moves can seal your fate, either in your favour or otherwise. Now imagine, just when you are advancing towards your next calculated move and are almost on the winning edge – the network CRASHES! Ouch! For gamers, it can’t get more frustrating than this. More than often old routers are blamed for this periodic network crash, since they are unable to handle the current data demand of the latest games. Online gaming as such requires stable and uninterrupted bandwidths, that is typically seen in wired connections. But thanks to the technological advancements, we now have a plethora of wireless routers with latest features and enhanced capabilities that have managed to put an end to all the connection issues – whether you want to increase your Wifi connectivity over a large area, or connect all important devices to the same router, or have multiple users streaming HD videos on the same network. 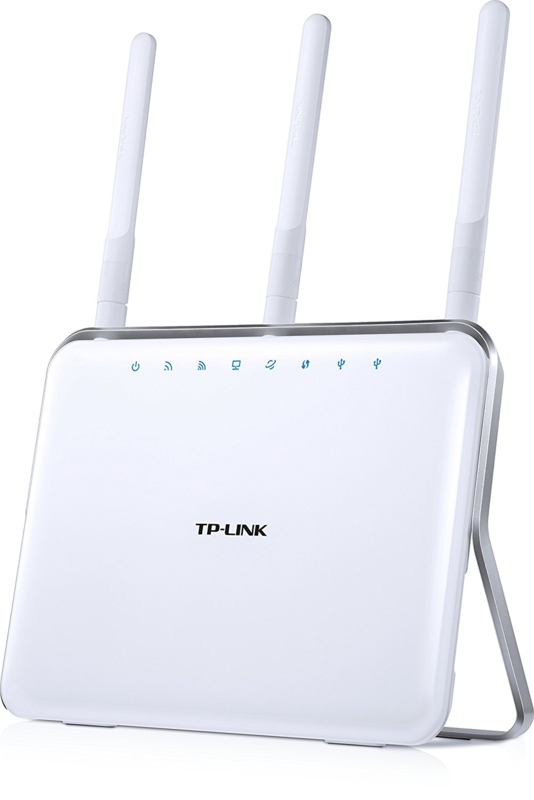 These routers can even fulfill the future wireless networking needs as well. 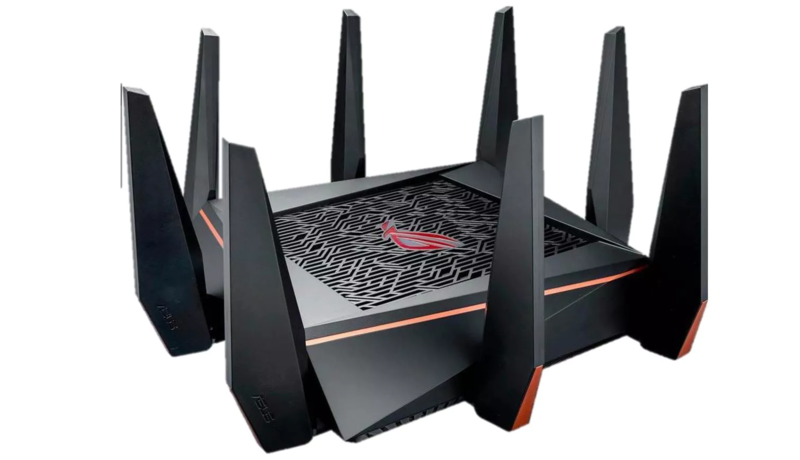 Asus RT-AC88U is one of the best looking, ultra fast and Dual Band (5GHz and 2.4GHz) wireless router that is perfect for gaming, extensive file sharing and even for playing high-definition 4K videos. It has 1.4GHz Dual Core processor, NitroQAM technology and 8 Gigabit LAN ports that offer expansive connectivity, and can deliver lightning fast speed upto 3167 Mbps – while maintaining its outstanding performance. In fact it has the potential to break 1GB/sec limit, but only with additional hardware (like Asus PCE-AC88). Other specifications include 512MB RAM, 10 MB/s USB speed, Trend Micro’s AiProtection for privacy & security, and four antennas with AiRadar universal beamforming that ensure a large coverage area of up to 5000 square feet. It also includes Gamers Private Network that specifically routes the gaming data packets for maximum efficiency. Asus RT-AC88U is available on Amazon. Check Price now. Netgear Nighthawk X10 AD7200 uses 1.7GHz Quad core processor and 802.11ad WiFi technology that gives you multiple streams of speed (up to 4600 + 1733 + 800 Mbps). This paves way for better 4K streaming or VR gaming, and ensures an excellent performance with speedy file transfers. The four external antennas boost the transmission signals while exiting and amply incoming signals on receipt. The router has two USB 3.0 ports, 6 Gigabit Ethernet ports (2 of which support Link Aggregation for faster connectivity to Network Attached Storage or NAS devices). A feature that sets Nighthawk X10 apart from other routers is the ‘Plex Media Server’ integration (with which you can manage or stream all your media files across all devices connected in the same network). It is also futuristic as it is capable of supporting 10G networking, provided you install a compatible switch or adapter cards. 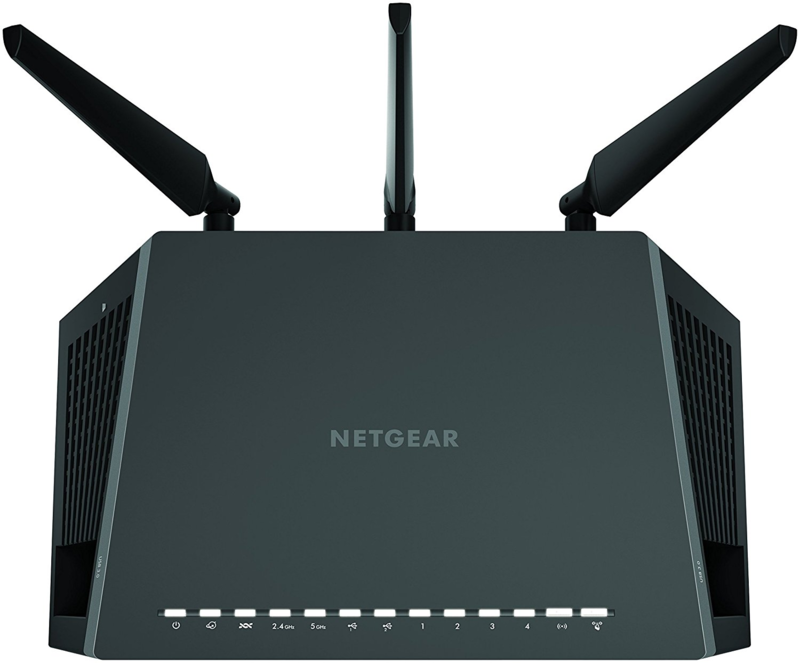 Netgear Nighthawk X10 AD7200 is is available on Amazon. Check Price now. 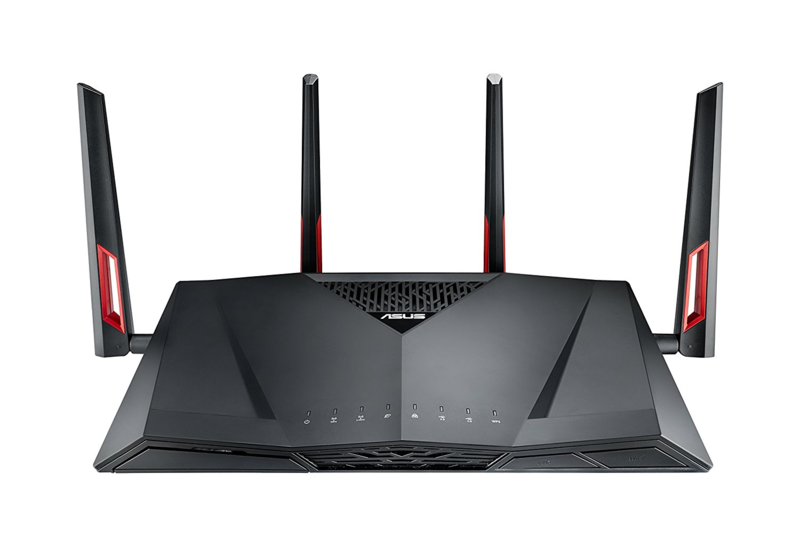 ASUS ROG GT-AC5300 is a first-class high-end router with powerful features for both online and network gaming. It is huge in size with 8 antennae -giving it a scary appearance of a spider. 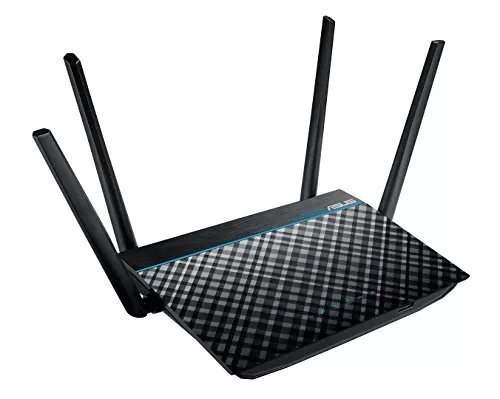 The router broadcasts three wireless bands – one 2.4GHz band at 1000 Mbps (can be used to connect older devices), and two 5GHz bands at 2167 Mbps (primarily for newer devices and gaming/ streaming, but also for easing the congestion caused by traffic or extra device). Other specifications include Broadcom 1.4GHz dual-core processor, 512MB RAM, 802.11ac wireless speed, adaptive Quality of Service (QoS) especially for gaming, WPA-Enterprise and WAP2-Enterprise encryption, 4 Gigabit Ethernet ports + 1 Wan port, 2 USB ports etc. ASUS ROG GT-AC5300 is available on Amazon. Check Price now. 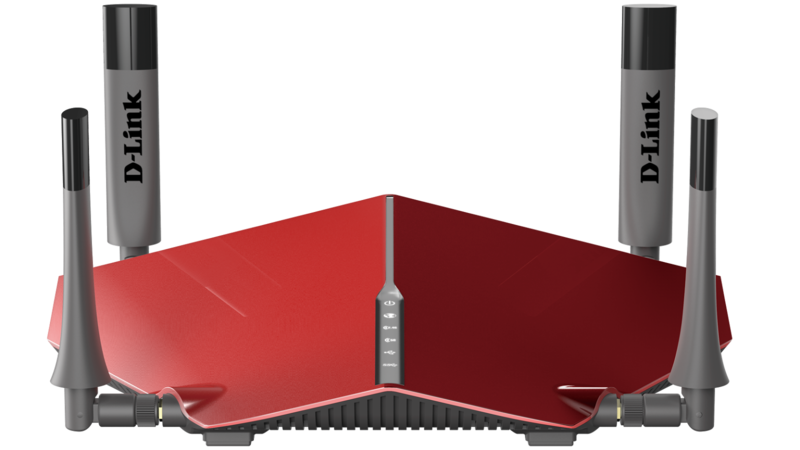 D-Link AC5300 Ultra Router [DIR-895L/R] is massive and has a bold shiny red appearance that catches your attention immediately. The Advanced AC SmartBeam technology (popularly known as Beamforming technology) along with eight adjustable antennae are capable of locating all devices within range and focus more on the ones demanding more data. It also provides a guest network, so that your devices or zones aren’t compromised and remain secured. Equipped with 1.4GHz Dual Core processor and 4096 MB RAM, the router offers tri band (1,000 Mbps in 2.4GHz + 2,166 Mbps in 5GHz + 2,166 Mbps in 5GHz) as well as 802.11 a/b/g/n/ac WiFi compatibility – with the top speed reaching upto 5332 Mbps. The specs ensure its optimum performance while the QoS optimizes the traffic. D-Link AC5300 Ultra Router [DIR-895L/R] is available on Amazon. Check Price now. 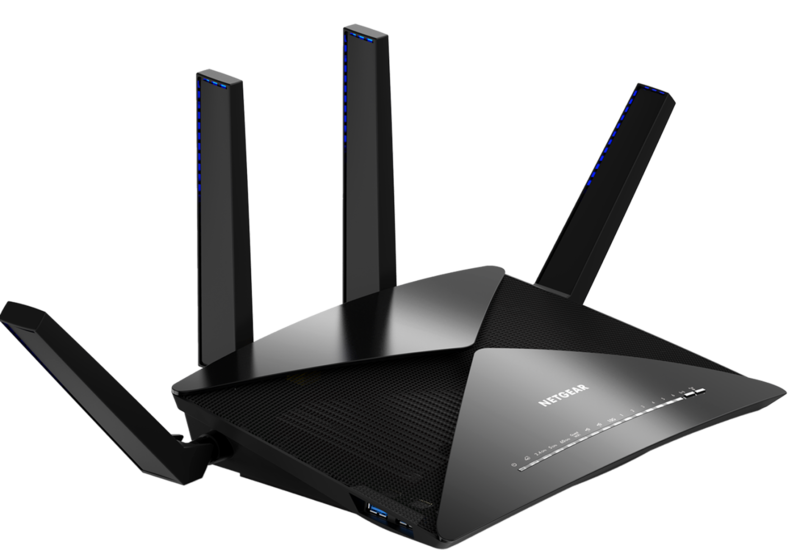 NETGEAR Nighthawk AC1900 broadcasts two simultaneous networks (2.4GHz + 5GHz) for both older and newer devices. The configuration is comparatively on the lower end with 1.0GHz Dual Core CPU, 256MB RAM and 802.11 a/b/g/n/ac WiFi compatibility that provides speed up to 1300 Mbps. Even though it has only three external antennas, they are powerful enough to increase the Wifi range and amplify the signals. The four gigabit LAN ports are apt for connecting gaming consoles and streaming devices to get a fast and smooth internet connection. In short, NETGEAR Nighthawk AC1900 is seen as a budget friendly device with an impressive speed and security, and that displays great gaming performance and fast video streamings. NETGEAR Nighthawk AC1900 is available on Amazon. Check Price now. ASUS AC1900 uses the TurboQAM (TM) technology that accounts for higher speeds. In fact, it is known to be 30 times (relatively) faster than most standard routers and provides a wide coverage area (with 2300 square feet as its bottom range). The router is powered by 1 Ghz dual core processor for faster response, while the latest dual band 802.11ac 3×3 technology gives you a combined speed of up to 1900 Mbps (1300 Mbps over 5G network and 600 Mbps over 2G network). It also includes AiProtection that provides a complete multi-layered security against all possible threats and vulnerabilities, blocks malicious websites and protects sensitive data. The router has a sleek creative design, is easy to set up and comes with an intuitive app for easy monitoring and configuring of the network. ASUS AC1900 is available on Amazon. Check Price now. TP-Link AC1900 Router [Archer C9] is yet another reasonably priced router that is in the league of top specifications and is reliable, easy to setup and has a simple layout. With a glossy white, smooth and curvy exterior propped up on a silver stand, the router has three antennas with white matte finish popping out from the top – that collectively make up for beamforming and multi-device throughput rates. It has 1GHz Dual Core processor with 128 MB RAM, that can handle multiple requests without interruption. The Dual-band 2.4GHz (600 MB) and 5GHz (1300 MB) can provide a combined speed upto 1900 Mbps. This makes it ideal for high bandwidth applications such as streaming in HD and online gaming. TP-Link AC1900 Router [Archer C9] is available on Amazon. Check Price now. ASUS RT-ACRH13 Dual-Band 2×2 AC1300 is one of the cheapest options for an outstanding performance and control for your system, as well as amazing gaming speed. It has the most sought after USB 3.0 port which is ideal for sharing documents and media files through the external drives within your network. The specifications include Dual-band AC1300 with 2×2 MU-MIMO technology that provide speeds up to 1267 Mbps. 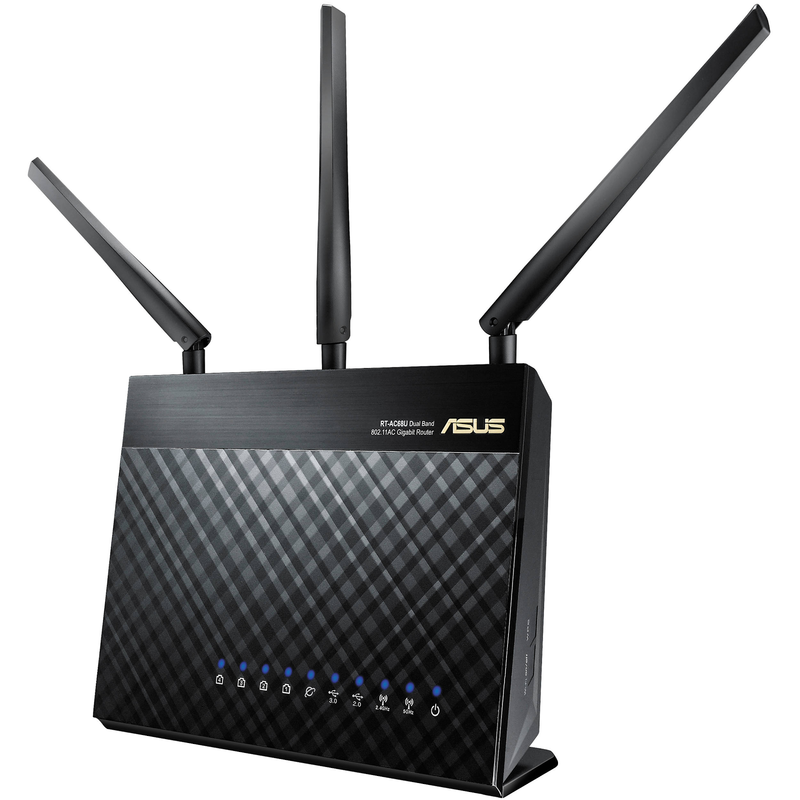 The four (high-gain 5dBi) antennas ensure that the signals are fast, durable and cover a decent range (about 2000 Sq ft), while the ASUS Router app makes it easy to manage the network with just a mobile device. ASUS RT-ACRH13 Dual-Band 2×2 AC1300 is available on Amazon. Check Price now. Netgear Nighthawk X4S VDSL/ADSL Modem Router D7800 is considered as one of the best gaming routers with 4×4 wireless speeds and MIMO technology. With a nice solid black finish, it has 4 antennas that are capable of displaying strong signal transmissions, and you can get upto 1733 Mbps combined speed from the dual band. It runs a dual-core 1.7GHz processor with 256MB of RAM and 512MB of flash memory. The router has an inbuilt modem, 4 LAN ports for connecting multiple devices directly and 1 WAN port. It even has an eSATA and two USB 3.0 connections which can turn the router into a printer and storage server (provided both a USB printer and an external hard drive are connected). Nighthawk X4S prioritizes the gaming packets over the network making for an uninterrupted and durable connection. Netgear Nighthawk X4S VDSL/ADSL Modem Router D7800 is available on Amazon. Check Price now. 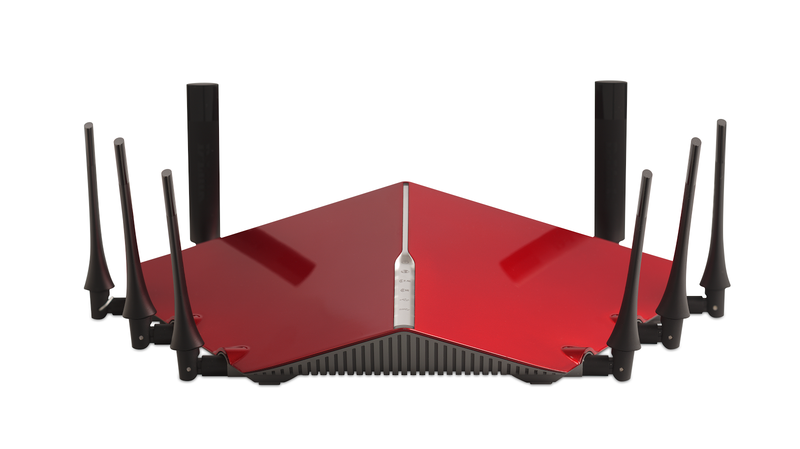 D-link DIR-885L/R is another one of the hot red and shiny routers with an angular shape, and which can be wall mounted as well. It has four detachable antennas that can be switched for more powerful ones, if you feel the signals aren’t satisfactory. However even with the current set, the signal remains strong and consistent. 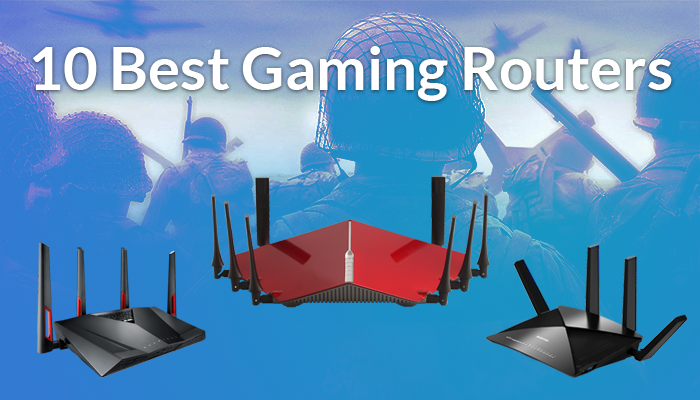 This router too has dual band wireless (1000 Mbps for 2.4GHz band, 2167 Mbps for 5GHz band) and supports DD-WRT open-source firmware that makes for a more flexible and powerful gaming option. It also includes a Quick VPN server (used to connect to a local area network securely) and a firewall for security. D-link DIR-885L/R is available on Amazon. Check Price now.